OBSTACLE - Sculpting Fear, consists of a series of public interventions that create a rupture in the accelerated flow of the city life. They propose a temporary counter model by creating an interference through standstill. 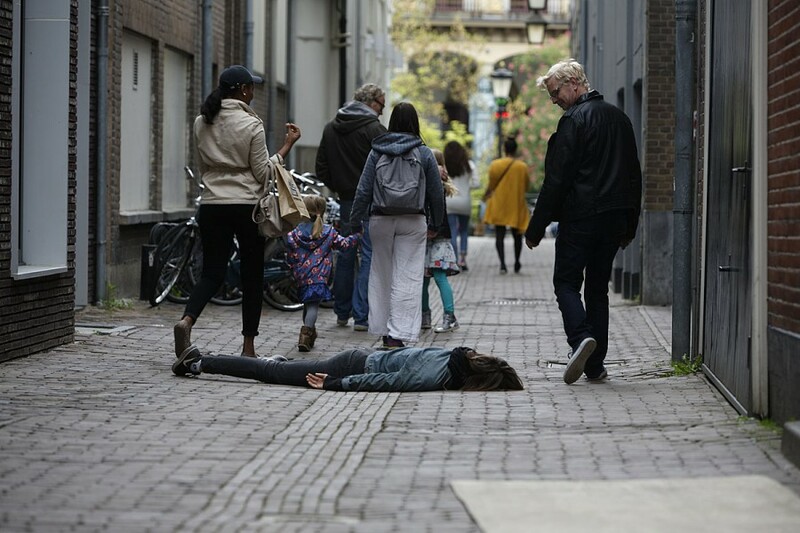 Obstacle is based on a very simple proposition: people lying on the floor. With a group of about 10 local performers a series of images, body arrangements and compositions are created in the public space. These images are a challenge for the security and the public order since they generate an obstacle within the pulse of functional streets. Idleness, standstill and deliberate collapse are responses to progress, growth and acceleration. Everything is under control. With the support of Fonds Podiumkunsten (NL), Gemeente Utrecht, SPACE – Supporting Performing Art Circulation in Europe, South East Dance Brighton through residency and Quadrennial Prague.